At Cal Poly sustainability is integrated into all aspects of the university from operations and infrastructure to outreach, education, and research. We rely on the generosity of donors to expand Cal Poly’s sustainability leadership - from academic learning opportunities for students to cutting-edge research and engagement that benefit our campus, state, and planet. 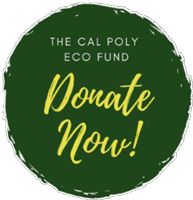 Please consider giving to the Eco Fund, your tax-deductible contributions help support our mission and invest in our students, faculty, and staff who make a difference both on campus and in the community.